As a teenager, both these albums had me air-harping in front of the bedroom mirror. Nothing else mattered. Kim Wilson and Mark Feltham were my surrogate blues harp mentors. Real-life harp tutors did not exist in 1980 suburban England. There was Tony ‘Little Sun’ Glover’s now famous reference manual, but we had no Youtube or DVD. We had to engage our ears and our imagination, take a deep breath and figure it all out by ourselves. Which is another reason why these two albums rarely left the turntable. While they were a joy to listen to, I was also trying to copy and learn from them. So what exactly is it that makes these albums so significant? The wizardry of all that full-throated blues harping and the sheer energy of the bands. Plus their choice of songs. They’re never, ever dull. Now my ear naturally gravitates to the rhythm end of the blues spectrum. I love and appreciate a slow blues, but more than anything I enjoy a good dance beat – something up-tempo or Latin with a good hook. Both records are so laden with the stuff that sparks fizz off their tailpipes. 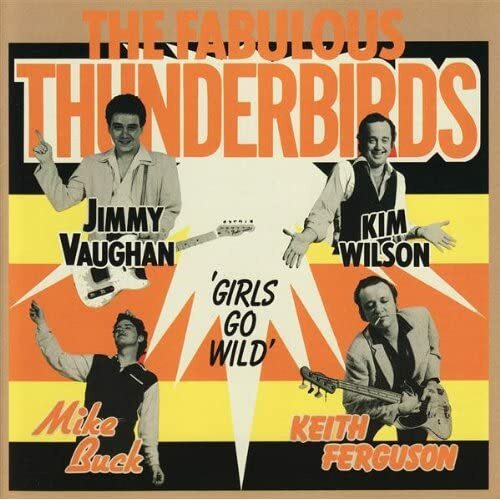 The T-Birds’ album is a swinging blues collection that drips with that big-time Texas feel. Well it would, wouldn’t it? Stevie Ray Vaughan’s brother is on gee-tar and Mike Buck is in his element behind the drum kit. As a teenager I had no idea who the Vaughan brothers were, or that Kim Wilson had been a disciple of George ‘Harmonica’ Smith. As far as the harp was concerned, it was all about the tone, the timing and the style I was hearing. ‘Pocket Rocket’ is a prime example of all three. And it was all about cool. ‘Wait On Time’, ‘Marked Deck’ and ‘Let Me In’ are real finger-clickers. ‘Scratch My Back’ hits the swamp blues tickle spot. ‘Rich Woman’ and ‘Walkin’ To My Baby’ provide the Latin interest, and ‘Rock With Me’ and ‘She’s Tuff’ are straight-shooting, 12-bar delicacies. There are even a couple of slow blues tunes, Full Time Lover and C-Boy’s Blues, but even these ooze with class. 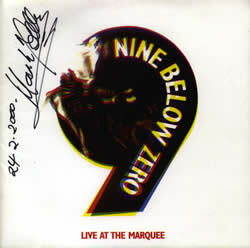 In contrast, 9 Below Zero were begotten of the UK’s pub rock tradition. Their album is a gritty, no-nonsense R&B feast with blues harp in every song. Yes, every song. But as already mentioned, it’s never dull or repetitive. Indeed, as a journeyman harp player you feel compelled to join in. In doing so you experiment with harp technique and by surmounting each hurdle, you can readily chart your progress on the instrument. No Youtube or DVD, remember. Back in 1980 I had no idea how heavily Mark Feltham was influenced by Charlie McCoy’s playing. I didn’t know who Charlie McCoy was! Even though it was ‘Stone Fox Chase’ that had got me started on the harp. I also had no idea that 9 Below were so heavily influenced by the J. Geils Band. ‘Homework’ and ‘Pack Fair & Square’ were just great tunes and the rest of the band’s selection of blues, Motown and pub rock resonated where it mattered. Right to my teenage toes. 9 Below played their own London smash’n’grab songs on the record – ‘Stop Your Naggin’’ and ‘Straighten Her Out’. ‘Three Times Enough’ and ‘Doghouse’ followed on their next album. Their affinity with Motown brought covers of Marvin Gaye’s ‘Can I Get A Witness’ and The Four Tops’ ‘I Can’t Help Myself’. Sam The Sham’s ‘Woolly Bully’ was thrown in to good effect, as was Hank Ballard’s ‘Hoochie Coochie Coo’. Then there was the blues material. Freddie King’s ‘Tore Down’, Otis Rush and Willie Dixon’s ‘I Can’t Quit You Babe’ (with its obvious Led Zep connections) and, of course, ‘Got My Mojo Working’. Each track is a lesson in how to use the harp as a horn section, lead instrument or vamper. Then there were those other two tracks. The special ones: ‘Riding On The L&N’ and ‘Swing Job’. Both remain essential listening and essential learning. The former has been featured in a previous Harp Surgery post. Crack these two, add ‘Pack Fair & Square’ and you’ll instantly join the ranks of the power harp brigade with audiences applauding you across the nation. To experience my first real taste of R&B with just one of these albums would have been acceptable I suppose. At that time I would have been none the wiser. But it would have been a one-legged existence. For any harp player and blues enthusiast from the UK, the two albums are somehow complimentary, of the moment and provide a comprehensive musical education. Call them apple pie and custard. Good enough on their own, but perfect together. I was fortunate enough to see both bands live by the way, and they were every bit as exciting on stage. Personally, these two albums were the headlights of a brand new car that was about to leave its parking slot. They’re still on full-beam. I think any sceptics out there should avoid jay-walking. Hi Wilf…have got to agree with your Live at the Marquee Choice. This was also the album that turned me on to harp. We went to see them in Belfast in the early 80s when I was a teenage Mod. They were supported by a group called Fast Eddie who were selling copies of their single My Babe. They also had a good harp player but it’s so long ago I can’t remember who it was. That was probably the best night’s live music I’ve ever heard. NBZ were jumping all over the stage like hyperactive monkeys on speed and they had millisecond gaps between songs.I never saw anyone with so much energy. Thanks for your comments. Fast Eddie! Blimey, you and I are definitely from the same era. I used to follow them very closely. Me and my mates even travelled out to Goodmayes in Essex one time to catch them. They were from Grays. Then they dropped by my digs when I was a student in Crouch End, North London. Their harp player was Gordon. Chris was their guitarist. Can’t remember the names of the bass player or drummer or any surnames. But they were utterly brilliant. Same genre as NBZ. In fact, now I think of it, I played in Leigh on Sea a few years ago and Gordon came to the show. We were a bit off-song that night but it was hilarious to see him again after all that time. Hey Wilf…I live in Leigh on Sea now.Let me know if your ever playing there again and I’ll come and see you. This part of essex seems to be loaded with Blues musicains and especially harp players! Steve Weston just lives a few streets away from me and I know a couple of others who I see quite regularly at local jams. The old Mod revival era from the late seventies into the eighties was my formative years. I grew up in Northern ireland and we had a huge Mod scene there and best of all it crossed the religious divide so I got to meet a lot of protestant guys (and girls!! )I would never had been able to meet otherwise. It also got me listening to some top music as well and started off my love of harp but I didn’t really start playing till the late 90s. Good to hear from you and keep up the good work. Yep! Moi aussi. The Live at the Marquee album was one of the first to get me harping (also as a teenage Mod – now a 40 something Mod – someone should do a straw pole – how many harpists started life as spotty little Mods? – quite a few I’d say). I’d be blowing away along with it in my own ham fisted way when I was about 15 – but if you’re gonna aim, you might as well aim high. Another of the first albums to get me harping (and on another Essex Delta tip) was Stupidity by Dr Feelgood – not because of the technical brilliance of Mr Brilleaux, who was, errr, basic as a harpist – but because of the attitude and energy (and because he was cool as **** to boot). Also, I think, the basic nature of his playing inspired me with the “I reckon I can have a go at that” spirit – which is quite important when you’re starting out. So which album will I be writing about for Harp Surgery? Stay tuned. I WANT that album, but it seems to be hugely expensive, anyway…Kim Wilson great harp player. What a treat to discover the film Cadillac Records (Amazon.co.uk less than £4…bargain) and find Kim Wilson doing the honours on the harp. It is the story of Chess Records with Adrian Brody playing Leonard Chess. It manages to tell the story well and brings it all to life. How come I have never heard anyone talk about this film….I loved it and so did the cast, according to the DVD extras. Jeffrey Wright is Muddy Waters, Columbus Short (Little Walter), Eammon Walker doing the best Howlin Wolf you could hope for. I loved it, I am sure that the purists hate it, but it brought the characters completely to life. The music was well chosen. To hear the likes of Moss Def (Chuck Berry) and Beyonce Knowles (yes that’s right, playing Etta James) clearly loving playing these legends. If you haven’t seen this little gem, give it a go….oh and Kim Wilson does a great job. I saw it, fantastic doc giving a real feel for Canvey and the scene, also mentioning another band that I had not heard of in years…The Kursaal Flyers 😉 Wilko seems to be gaining a lot of TV time at the moment, he was in the new BBC Rockband thing which looked at guitarists last night, not a great program.